Thanks Danny, that is what I have got. Was that part of the kit? Yes, but it has no adjustment. It is just there. No way to increase tension. Unless I am missing something. If you get a chance ask the mechanic. thanks for the relevant opinion? What has no adjustment? Are you talking about the auto tensioner that came with the kit? The other belt should be adjusted via the alternator. Sorry I just hate to see such a well put together rx8 with this rare kit be put in the hands of a banned tuner who has blown motors. Who are you thinking of? Might be handy to list they who do it as a business. You have Brett and Kane, but do they do it for money? 9krpm got a good tune from someone, hoss might know. I stopped doing it for free a while back ..... As far as selection goes , I just don't like to do a remote tune for someone who has no clue about their car . Steve Kan tuned mine, but he doesn't do remote tuning (from scratch anyway, he will do "touch ups" remotely). You can fly him in though. He is getting into the Adaptronic though which is promising. This is not a standard kit in anyway. The blower is much larger and air cooled as apposed to the petite set up. It can also have bypassing issues. The car really needs to be brought into a tuner or the tuner brought to the car. Doing a project like this will be frustrating to do remotely. While I don't have love for MM im sure he could do a fine job. Where is the car located at maybe we could help you find a tuner. North Europe Im afraid. Down to England and northern Germany would be possible I guess. 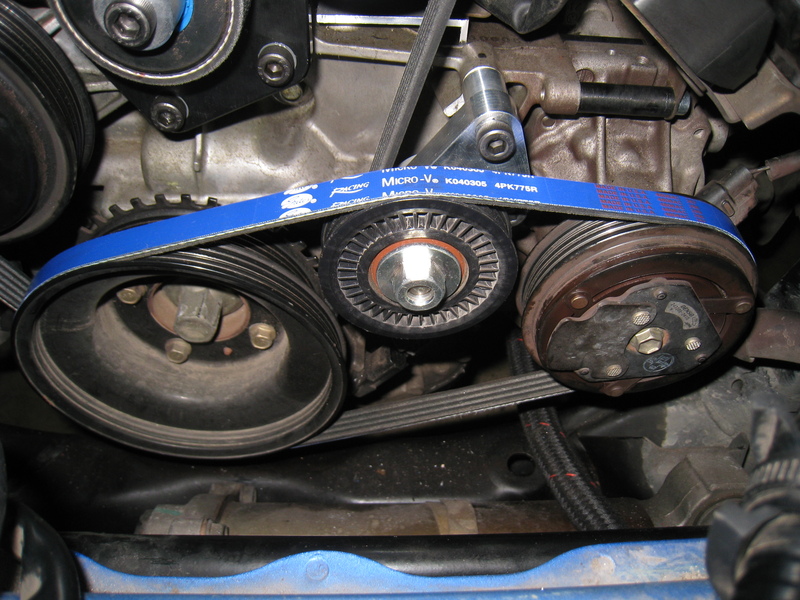 Hoss, the alternator is no longer adjustable, the auto tensioner goes on the belt. The AC is supposedly tensioned by the replacement pulley seen in the pic above, but I am not sure how to do it. What did u pay for the kit and where did u get it from? Looking to sell the kit. MOD EDIT: Please keep F/S threads/posts within the classified sections. Once posted all items MUST have an asking price. That may happen Team. Mine is still up for sale but i have a specific buyer in mind who dose not have the funds at this moment.